Some of you might remember that back in 2014, we purchased an old house in a village here in Romania. (Those who don’t can check out the original article here). The plan was to make the place livable and enjoy some of the summers there and maybe even grow some food there as well. Well… things didn’t really go according to plan. 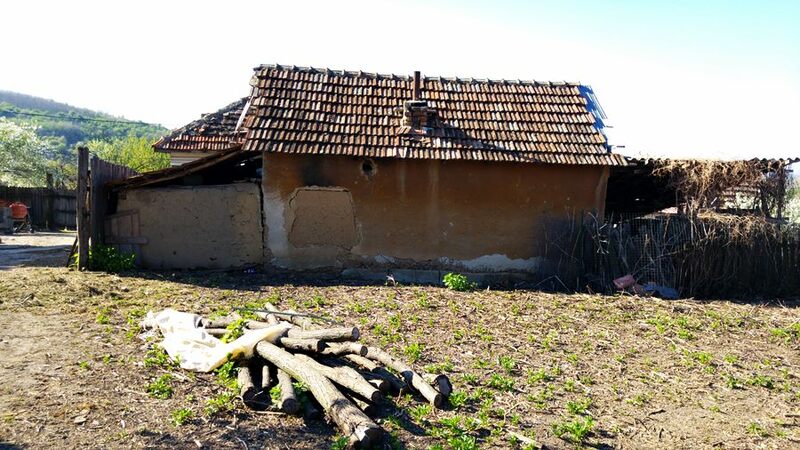 Three years after purchasing the village house here in Romania, we still haven’t managed to make it livable. Sure, we’ve spent quite some time there to enjoy the fresh air and do some very minor improvements, but truth is that you couldn’t live there long term. I wouldn’t even spend a night there. It’s that bad! And this picture-heavy article will show you everything. But we’re planning to make things better this year when we have more time to invest and a little bit of money set aside for this project. 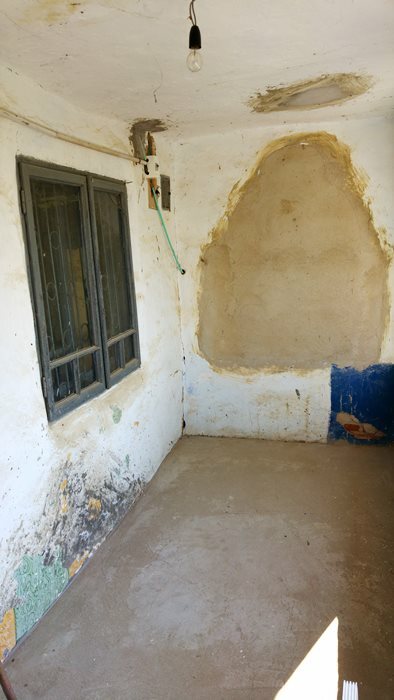 We won’t be able to do a complete remodeling of our village house, but my dream is to make at least one of the rooms livable so we (or at least I) can spend one night there. Right now, we’re getting there in the morning and leaving in the evening since it’s a 40-minute drive away from home. Until then, I took a ton of pictures to share with you the current state of the house. It is, in many cases, worse than we bought it – and we didn’t even think that was possible! I’ll write more details under each photo, then continue with our plans afterwards. Things look decent when you enter the yard and you’re welcome by all the flowers, right? 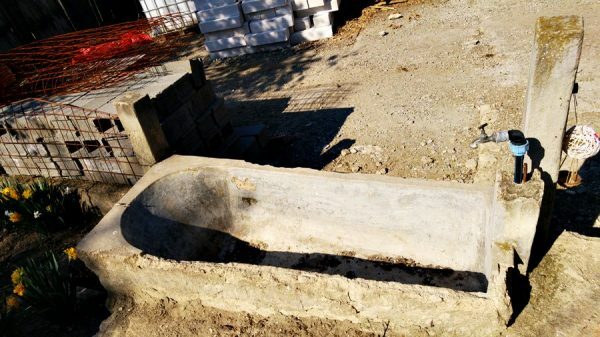 This is the “septic tank”. It is ruined and unusable. Getting this done would cost a little fortune. This means that one of the biggest Pros we had regarding the house is no longer true. At the moment, we have no running water in the house. None. Nothing. Not a single drop. 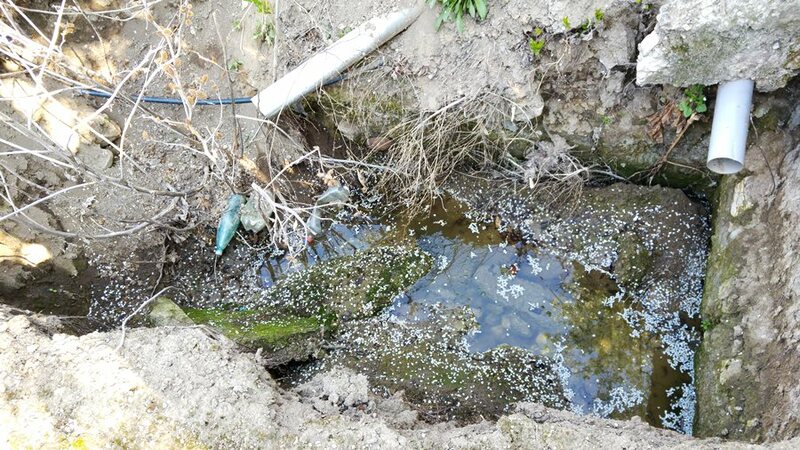 Fortunately, there is still a pipe in our yard, but it was cut and made unusable by the water company because they claimed neighbors came and took water from a faucet. Since there was no counter installed on the pipe, they never knew how much water was actually consumed – and there was nobody to pay for it. This will be our main source of water soon. Way better than nothing! This is our porch. We installed a new electrical counter and had our neighbor remove all the junk that was filling it. It was literally impossible to move here because of the junk. Welcome inside! A small hallway which was filled with dirt and still has to be cleaned constantly. The room we used until now – I applied a coating of paint over the arch and even if it’s still far from perfect it showed me that repainting alone will improve everything a lot. The fun thing about this room is that the arch was actually a wall and the opening in front was part of the porch. 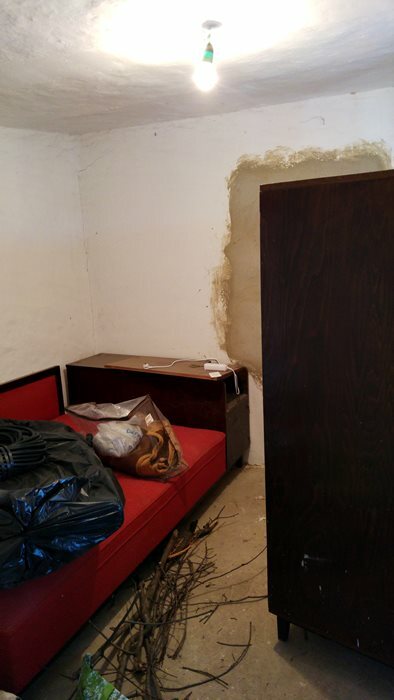 The previous owners wanted the bigger room and also added cement on the floor. What they didn’t think about was the fact that this raises the level of the room and as a result the door no longer fits. And since rooms in Romanian villages are usually not too tall, this means that I constantly bang my head on the top treshold – things have improved a bit since adding the bug-net, though. The second room. 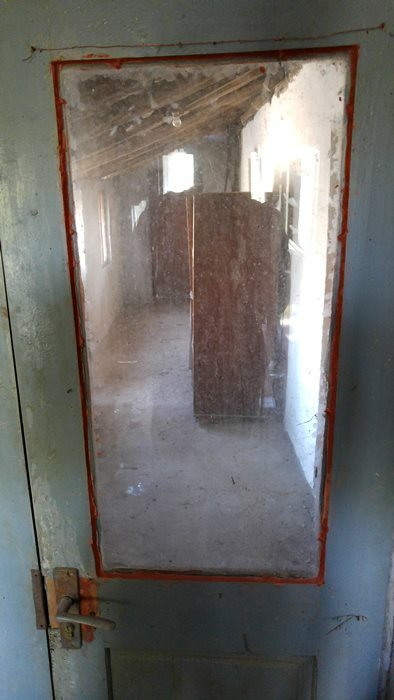 It’s filled with furniture and there’s also a hole in the wall that some mice used to make it their home. Fortunately, this one has a door so the mice (hopefully) don’t share the entire house with us. 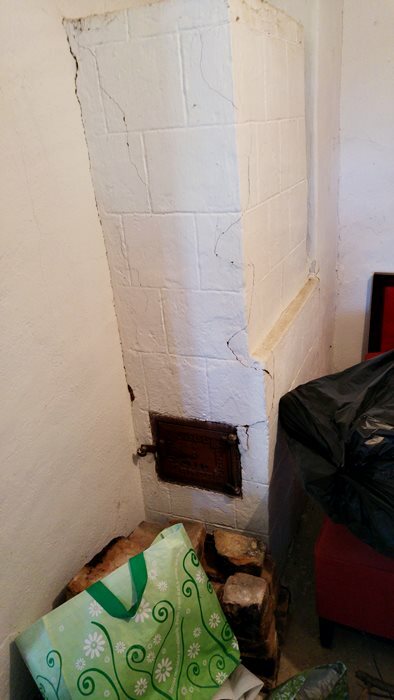 The room also has a terracotta stove: I wouldn’t use it in its current state, though. Insulation and a ton of work is required here. The thing with this hallway is a bit more complex. Usually, village houses in Romania have a separate room in the yard for cooking (known as a “summer kitchen”). This house had them built near the house and the hallway above did not exist. 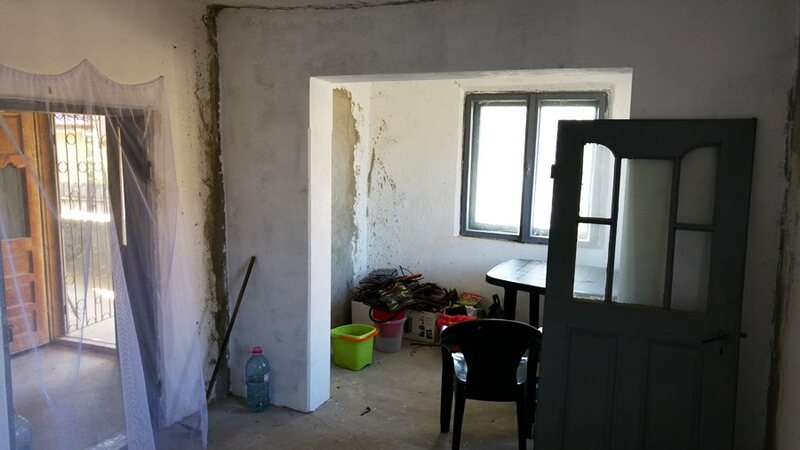 The former owners extended the roof, built the walls to the left and basically wanted to close everything in to make it easier to access the two rooms during the winter. Of course, they didn’t manage to complete the project. Even worse, they no longer had the keys for any of the two doors (one to the left and one at the end of the hallway), so we’ll have to replace them at a point in the future, but for now, we’re using the main entrance of the house to get minimal access there. First room on the right is a nice bathroom. The window at the top can never be closed and currently it’s completely useless since we don’t have running water or a septic tank. Notice the stove-looking thing to the left? 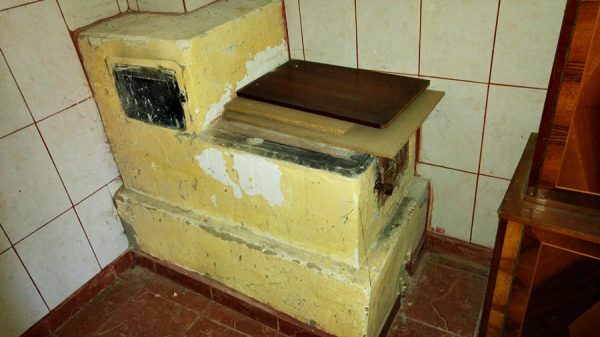 I think it’s a really nice thing: it’s actually the stove in the kitchen (you’ll see it below). You make the fire in the kitchen for cooking and it heats up the bathroom. A great thing during the winter, but not so smart during the summer since you have no control and can’t turn it off if you want to cook there. Well, I doubt we’ll ever use it anyway. The stove that is shared with the bathroom. 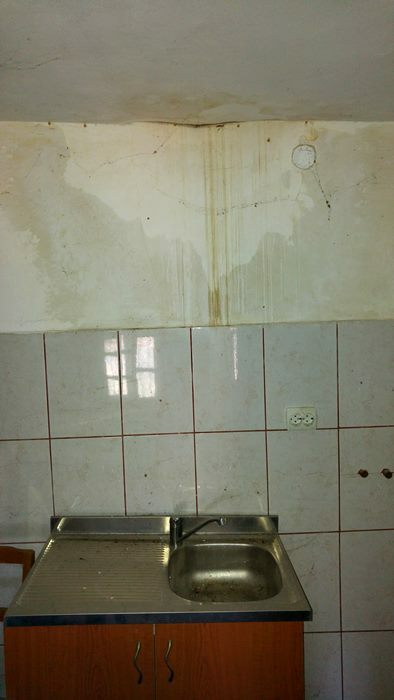 There’s also some water damage in the kitchen. This means leaky roof, which means a horrible problem (at least in terms of money). Back outside: side view of the house, continued by the hallway with the bath and kitchen, a shed and two more rooms at the end. The shed and the rooms. They have been used by our neighbor to house his animals and the smell is horrible: I doubt that they can be used as anything else from now on. So you might be wondering why is there so much junk in the shed and why did our neighbor house animals in our rooms? Well, the previous owners have left him to take care of the house starting several years ago. 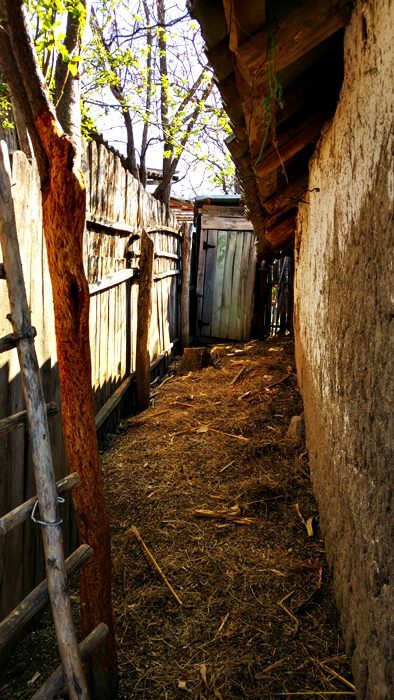 Since the owners have moved to a different country and he saw that nobody even came to visit, he made the yard and those two rooms which he could open his own. When we got there, there was a ton of crap that he had stored there and it was very difficult to make him leave. 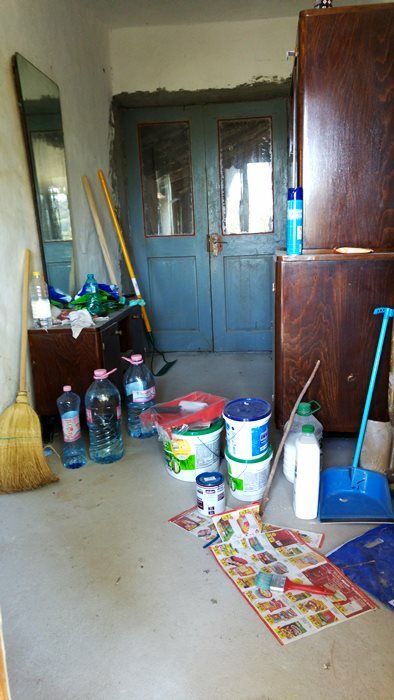 Even though we speak the same language, getting to actually have a dialogue with villagers in Romania is very difficult. He found it difficult to understand that he has to move and sine we haven’t really visited often during the three years since we bought the house, he kept delaying his actions. He did remove some of the junk but there’s always something new popping up. He was keeping his horse in the barn area, he’s growing chicken in the rooms (which he lets roam free outside as well) and even grew goats in the small space near these rooms. It is a very difficult situation to deal with: he keeps saying that he has no place to move them to where he lives (which is across the street) and he doesn’t have the money to build their own sheds there. 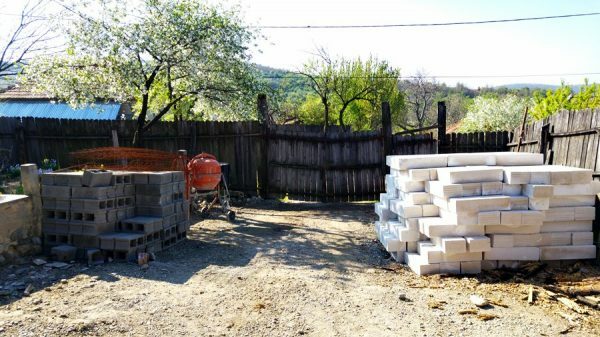 He did buy some materials and started work last year, but progress has been incredibly slow. He started to understand that we’re more serious than ever and I was a bit tougher with him, so things started to improve: he removed the horse and the goats and promised to keep the chicken locked in and take them out by the end of the month. Why can’t I call the cops or just throw out his crap? Well, things don’t really work like that in Romania. Cops would probably solve nothing anyway, but I would get an angry neighbor who could do a lot of harm without us being able to prove it. In the end – we only visited on 10-15 occasions last year, which gives him a lot of time to do a lot of bad things. So we’re trying to keep calm, keep the relationship as good as possible and take it slow: he will remove everything… eventually. It’s how things work in Romania, especially in the villages. Fortunately, things are better in cities. Now don’t expect situations to be similar in every village. People don’t (always) take over abandoned houses and start raising animals there. Although it could happen, haha. A view of the yard. More of the neighbor’s junk and a bit problem: in the back, you can see that the fence started collapsing. It’s even worse to a side: that’s the house of another neighbor. There should be a fence there. 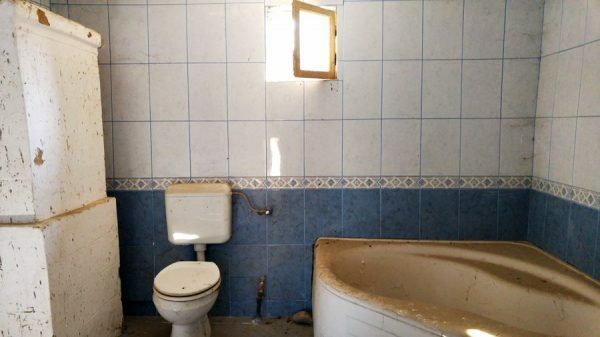 The thing at the back is the outhouse. It’s really horror right now because right next to it live the neighbor’s goats and the smell is worse than the worst thing you can imagine. View towards the gates to our property. The building materials are stored here (obviously!) by the neighbor and they will be used to build the shed for his animals. But despite all the negatives, I love the nice open view from our porch. Things will get better! Completely remodeling this house would require a ton of money which we don’t have and even if we did we wouldn’t invest them all there because we’re still not sure we’re actually going to stick to the schedule and visit. During the winter months, we’ll surely stay away from the house since there would be little it would have to offer us. So at the moment, repairing everything and bring it up to norm is not something we’re thinking about. But I want to make our trips there as pleasant as possible and even some minor adjustments and improvements will improve it a lot. This year, I am planning to do (at least) the following and the fun part is that I want to share the progress here on the blog. One of the interesting things is that we will hire people from the village to help us – so it won’t be something done by real professionals. It’s interesting to see the results. – Solve the biggest problem we have right now, which is get running water in the house. Carrying a ton of 5 liter bottles after you each time you visit gets old fast. – Rebuild the outhouse and make it less of a nightmare to visit. – Fix or most likely install a new fence. – Make at least one of the two main rooms livable so that we can spend one night there. I did some tests already and simply cleaning everything, filling the holes in the walls and just adding some paint improves the room a lot, so that’s what we’re doing. 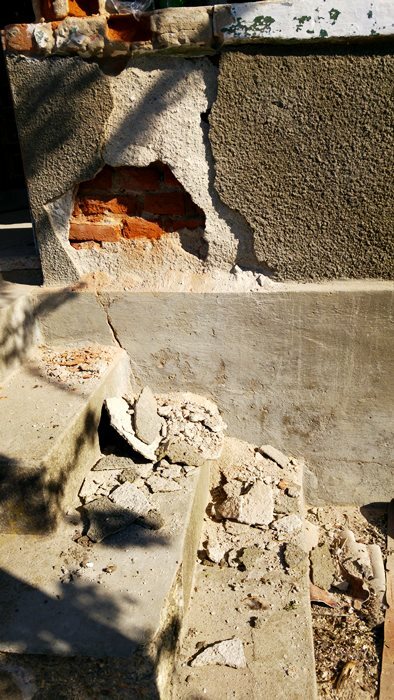 Ideally, the walls should be taken down and rebuilt – but we’ll leave that for later. – Get rid of all the junk furniture in the house. So these are the plans. If we can achieve more, it would be perfect. I am personally concerned that the coating on the house will keep falling and crumbling, allowing the bricks and adobe to be affected even more by the weather. But we would have to remove the entire coating and add a new one for the whole house and I believe that the costs would be too high for us to afford them. I’ll have to look into this to know exactly what I’m dealing with. So… there you have it. A long article that surely took you some time to read (it took me even more to write it), but something that probably gives you a bit of an insight into the not-so-beautiful part of living in Romania. But hopefully it’s an interesting project to follow. 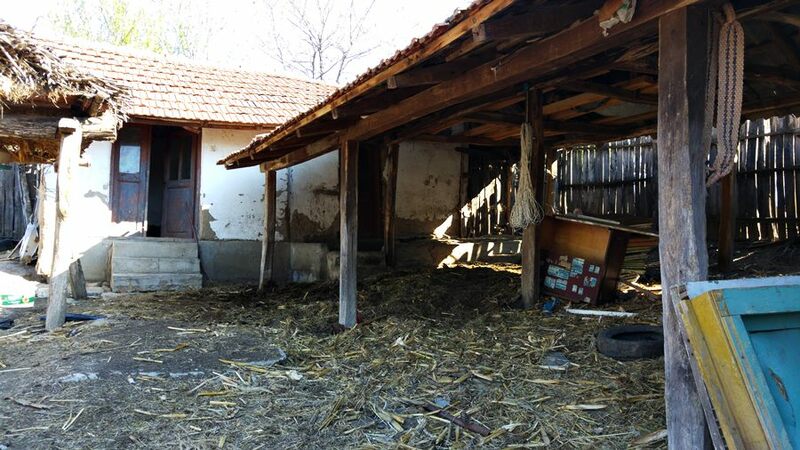 Next articleStray Dogs in Romania: Are They Still a Problem? 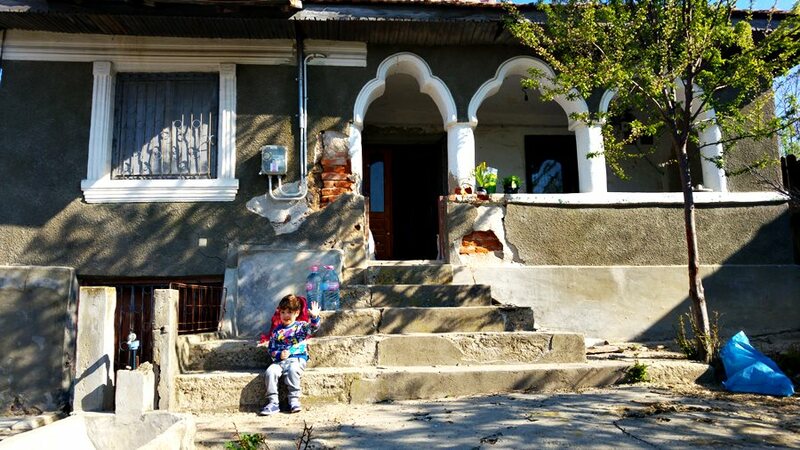 There is a mass influx from most Romanian villages which are in more remote areas (like this one). In this village alone there are a lot of properties for sale and nobody wants to buy. We also spent 5,000 Euros for the house and a big chunk of land near the village – somebody offered us 200 Euros for the land (which we don’t use, nor intend to) so it’s definitely not the case of the land costing more. I thought about selling it for a loss, but it’s really difficult to find anything that is as good as this for the money. It’s strange to say “as good as this house” since the situation is as it is, but that’s the truth. Since we’re planning to only spend several weekends per year there, spending a lot more on a house would make no sense because we wouldn’t be there to take care of it and it will soon end up like this one (minus the neighbor, hopefully). Prices for fixing stuff are also village-priced. We have already talked to somebody to fix our gate and they will do it for ~ $12. This includes digging holes, removing the beans holding it, putting everything back and getting a gate we can actually use. There’s a lot of work for $12 and there will be two men working on that for one day. Changing the electrical counter and doing a bit of maintenance cost us about $20. So we’re not talking about a lot of money in the end to make it livable for weekends. We won’t invest too much in it and if it doesn’t work, we’ll take the loss. But I want to try first. p.s. Here’s a funny show about a couple moving to the country. 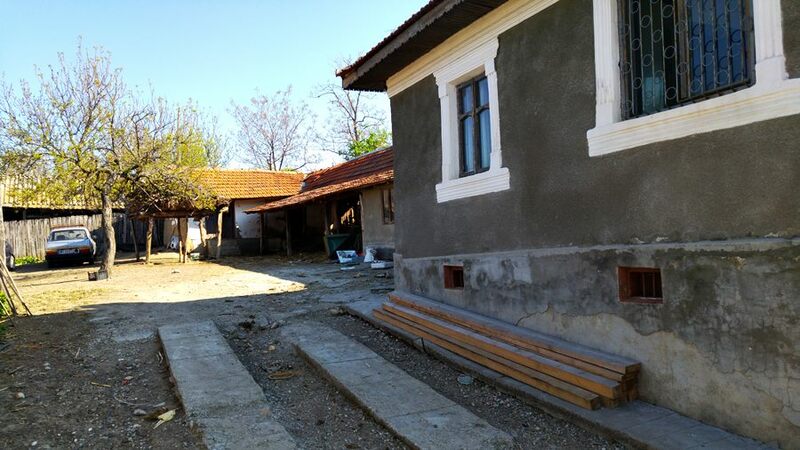 I think there are option for pre-made houses in Romania and the prices are similar. 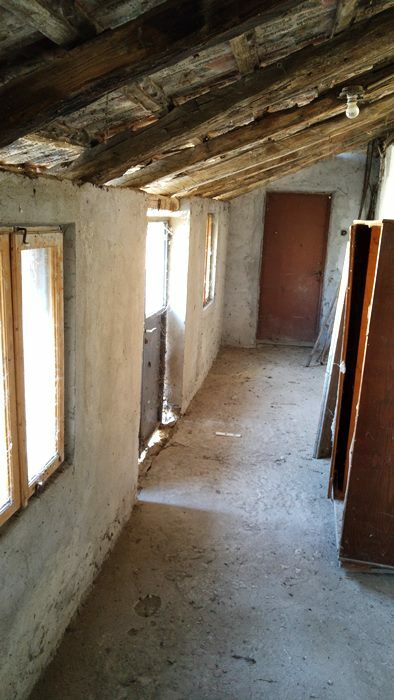 However, it makes little sense for us to pay 36,000 Euros for a village house we might never use (the price would be higher than what we paid for the apartment we are currently living in). 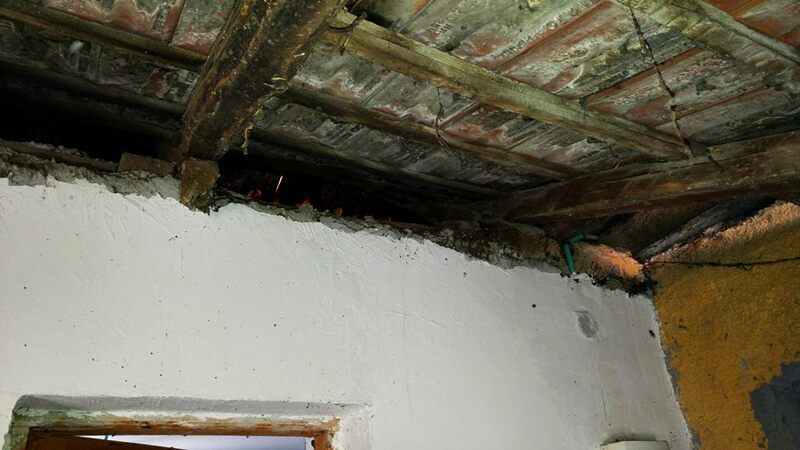 Our plan with the village house is not to completely remodel it, just fix enough of the problems to be able to enjoy it more during our short visits there. We don’t plan to invest too much in this house until we’re sure we’re going to spend time there to make it worth it. And even though it might look like something extremely expensive for somebody living oversears, I don’t think it will be like that under our current expectations. It is a very interesting story to follow! You certainly have your work cut out for you R. It’s funny, things like that happens at home too where basically strangers will move in onto dead property. They scout the obituaries and move into abandoned spaces and can take years to get them out. Most times you have to pay them a fee. You have an ambitious objective for the year. I hope you made it and don’t have to lug water with you all the time. You had me at the garden. I was like..this isn’t bad at all. Reading further.. I was like..oh sh*t!!! Lots of work..haha.. Baby Romanian is so cute ☺️. I’m looking forward to seeing the improvement. I look forward to how your projects progress. I am interested in what you find for hired help. I have the feeling that you can find some pretty skilled people willing to work for a few extra Lei off the books. Just a matter of putting together some funds and spending them wisely. I think you can get that place pretty livable just by getting one good safe room to live out of and yes water will be critical but YOU can be a plumber. Watch some video on line and start laying your own pipes. Not that hard just need to get cracking on that list of chores you got and farm out the hard ones. Good luck!!! Thanks, Otto! The villagers are definitely a lot cheaper than getting work from the city (which would also mean that I’d have to pay for transportation, food etc) and those still working are retired, but they did a good job when they were working. I was beginning to wonder what had happened to your summer house in the countryside. Well, it looks like you have made some improvements (hooray!) and a few things have gotten worse (boo!). I think those clay tile roofs are not so bad to fix. Maybe you can find where it is leaking and send one of the neighbors up there to replace a few rotten roof lats and replace any broken tiles. Yes, if water has gotten underneath the stucco plaster on the front of the house and frozen a few times, it will probably come off very easy. Hey, always think positive! I hate to say this, but maybe a less piecemeal approach would get things moving a little faster and stop the backsliding. Could you get a decent contractor to come look at everything and give you a quote on the various projects? Yes, he will probably pad the price a bit to make some profit, but at least it would give you some specific goals to focus on/save for/do a GoFundMe for. And it would be easier on your health too. 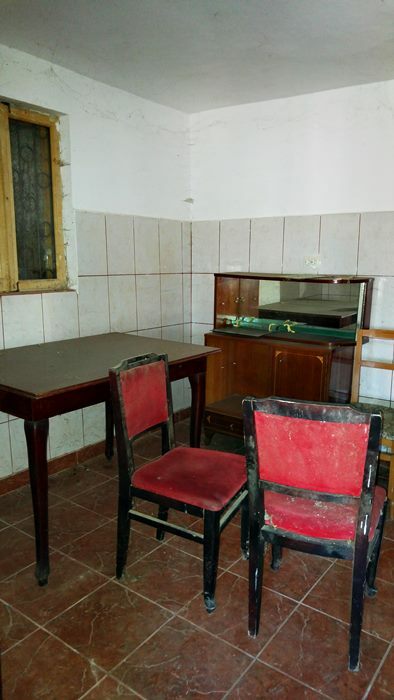 I think you got a good deal on the house and land, but a “fixer-upper” always needs at least the same amount of money stuck into it to make it perfect. I think at 10,000 Euros you would have a wonderful weekend retreat. Beautiful vistas, fresh air, fresh vegetables from your garden, dogs barking, roosters crowing… ahem, some carnati and mici on the grill… a bottle of beer in your hand… your wife giving you adoring looks… it doesn’t get any better than this! Heck, maybe you’ll ditch the city apartment and move out there full time! Haha, you did manage to paint a really nice picture in the end. We’ve already had our fair share of mici and carnati on the grill (last time was after taking the photos in the article, actually). OMG!!! You are a braver man than I! I’ve tacked my share of home improvement projects, including a second home in the mountains that became my primary residence. Nothing like this, however. I’m looking forward to soon becoming a relaxed Romanian city dweller with memories of those project days behind me. 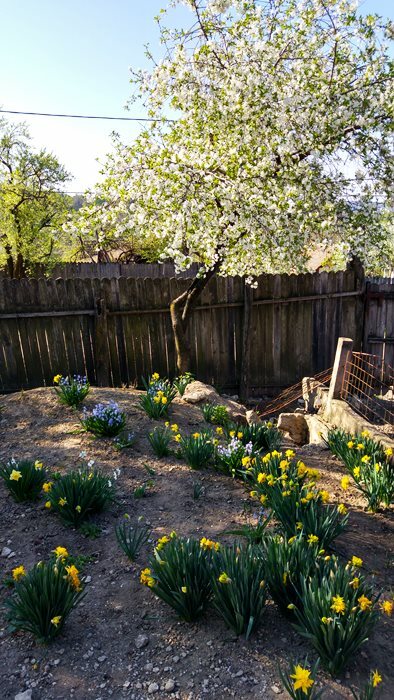 On the upside, however, those daffodils are beautiful! Ours here in the mountains of Southern California are also in bloom. Perhaps my favorite sign of spring. 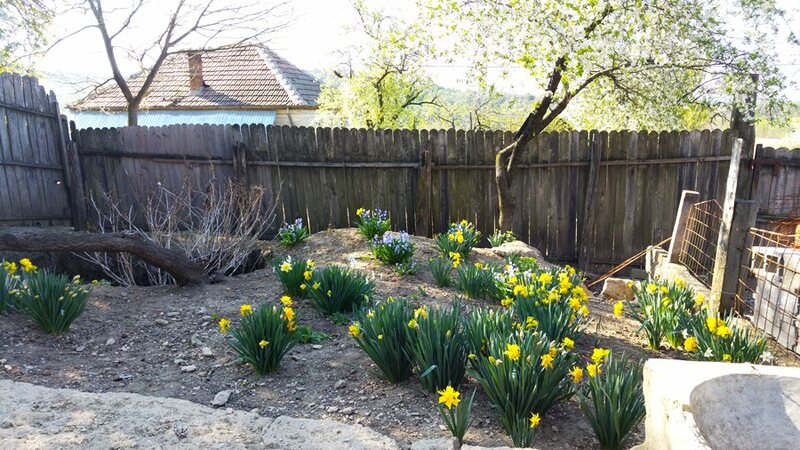 Not that anyone asked me about what I think…but, the flowers in the front area is my favorite place to be there. I can only walk more relaxed (but not entirely) in the first part of the house, but the second, thru the door into the long hallway, gives me the creeps about bugs, and spiders and spider webs. I dream about cleaning up the back yard, fill it with grass that I can run on, bare feet, with Eric. Making picnics there, and building up a brick barbecue with my own hands (yes, mine, I love building stuff). Maybe even a wooden covered area with table and benches, and definitely a swing or a hammock. I would love to see nightfall from that garden, I can only imagine the amount of stars you can see compared to the city sky, but I, in this moment, can’t imagine myself sleep in the house. Though a tent outside in the summer, doesn’t sound that bad 😛 But we need to fix the fence as there are wild dogs rooming around. It is a very challenging to manage what you want, and how to please family’s members. But the only problem with us is the language, when it comes to non-english speakers outside cities. Finally, I do encourage Collin to proceed with what you have and enjoy life. Have a great time at the Dead Sea & come back with great memories, Emad! Thank-you for the update. I too was wondering how the house was coming. Very interesting especially regarding the neighbors and their actions. I enjoyed reading this and looking at the pictures. It really seems like a long term adventure to kinda finish the House. That the Neighbor took over the House to raise Animals is also new for me. How bad or good is the Situation with the Electricity stealing and the 3G – 4G / Internet connection at your Village House? I am not really sure what to say about electricity stealing in the area, but I would assume that it’s minimal since most houses have new electrical panels and I think it’s more difficult to steal from those. Regarding the internet, I don’t get even 3G coverage in that area, but the internet speed is decent. Only tried on mobile, though. However, the people living there told me that there are options for installing broadband internet via a national company (Romtelecom). Have you considered container houses? I don’t know the exact prices but it looks like you can get a bed room, living room and sanitary around 5000-6000 euros. As you are not planning to live there immediately, it may be a solution until you can build a decent house. 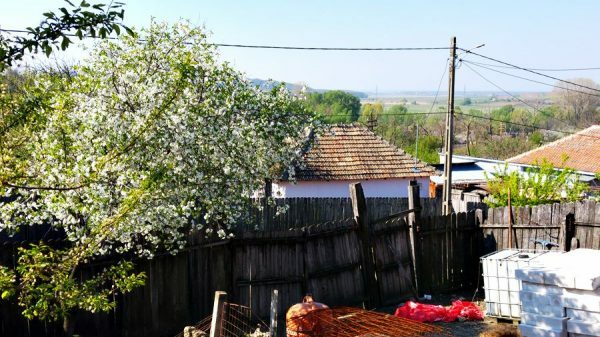 I am planning to move to a Romanian village myself, hopefully before the summer ends. As I lived in only large cities and still have doubts that I will survive a Romanian winter in a village; I will not risk buying a property heads on and I am looking for a rental. Being a foreigner will make it a bit more challenging but I really want to give it a try. I am also planning to keep a video log of entire experience from first day. I will gladly share it if you want to publish it in your blog. 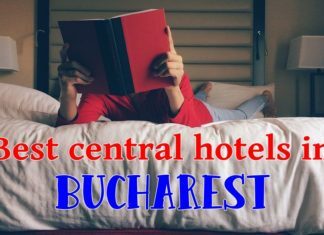 Finding rentals in Romanian villages is a challenge in itself 🙂 However, the houses that would be up for rent would definitely have all the required amenities, so as long as you are close to a larger city to do the shopping, you will surely be fine. Sure, let me know once you start your vlog series, I would love to check it out and I am sure that the readers of the blog would feel the same. It’s been a year since we bought it, but it’s still ‘unlivable’. But we’re getting there. 1. we contacted a firm in Arad and got a plastic septic tank. It’s already ‘tied’ to one of our 2 bathrooms, and our WC is already working. If you want to look into it, drop me an email and I’ll get you in contact with my husband to tell you the details. He’s also a civil engineer, so he’ll be able to really help you out with some excellent advice. Such a tank cost us 2000 lei, which is not cheap, but not impossible either. Top of the line, will last a lifetime. And IT WORKS, since we’re using it. 2. He’s done the electric work, cables, sockets etc. 3. We have used plaster board in the kitchen (the room we plan on finishing so that we can spend the night there) and now we’re finishing the walls. We’ll have to work on the floors and we’ll slowly get there. Unfortunately on our side, since writing this article, we’ve only managed to get there a couple of times. However, I really like what I hear about the septic tank. My research showed way higher prices for them and I really like the cost for the plastic one. It’s definitely an investment worth looking on. Just been looking through all your website and enjoyed it very much. I am English and first went to Romania for a project back 93. I fell in love with the place and went back often, so much so in 2016 I bit the bullet and finally bought my own place in a small village in Judet CS. At the moment we spend all of our holidays there spreading them throughout the year. We have a 6 year old girl who has been coming with us to Romania since she was born and was just 3 months old the first time. She loves village life and the locals have accepted us pretty much without exception well. Our house isn’t in need of so much renovation and work as yours, but its still a continuous project and I spend a lot of my time there working to maintain it and get it to how we want it. Regarding the internet, in our village the infrastructure has been completely used up and none of the big providers which all use the same infrastructure that is locally available to us can help for now, however I ran some checks and discovered that I had good coverage of Orange mobile and bought a Orange Flybox direct from Orange.ro and manage download speeds in excess of 12 mbps which is better than my neighbor gets with his Romtelecom adsl or another neighbor gets with Aktar so I have a result. I installed a cctv system for remote monitoring and had to use a 3rd party service (noip.com)to get round the lack of a fixed ip address via the mobile provider, messy but once set up works good. Ultimately we will move there but with Zara only a couple of years into the UK education system that is some way off. We wait for firm information how things will unfold with brexit and what status we as UK citizens will have afterwards, so much so we have been looking at passports/resident permits etc which led me to your site, thanks. The food fair looked very much like it was in Drobeta? I know DTS well and spent a lot of time there in the 90s and have many friends in the area who we keep in touch with and visit when we have time. Are you based there? Sorry for the long first post/introduction. Keep up the good work and will check back often. 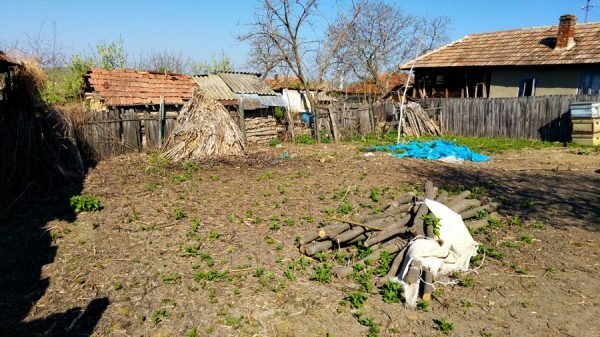 I’m happy to hear that you are enjoying life in a Romanian village. It’s a good village too if you can leave the house unattended for so long and you don’t have any problems! I am sure that the Brexit talks will go smoothly and there won’t be any need for passports and permits or such… but it doesn’t hurt to do a bit of research before hand. There’s still a lot of time left until you can retire, so rules might still change. And on Romania’s terms… hopefully things will get easier. Regarding Drobeta – yes, that’s where I am living. I’m happy to hear that you have contacts here and getting well with people in the area. Just read some more of your articles and see you are indeed in Turnu Severin. Interestingly we are just a few miles further on from Baile Herculane where you visited and took those lovely photos. By the way there are still wolves in the Cerna valley, we know first hand! Wow! I really didn’t know that – I didn’t think it was still possible for wolves to still roam those areas. Actually I realised late night that it was actually 2015 and not 2016 we bought the house, times flies! Next month when we are there again will be the 2 year anniversary of us completing the sale. Yes we are lucky it’s a lovely village and so far no problems regarding security. We live really close to the current mayor so that helps too I think and we have made an effort to get on with locals and neighbours. I read your article about village life and you make very valid points. We take our water from a well in the yard and use a hidrofor to pump it around the house so are now not reliant on the public supply which in the summer months tends to be a bit hit and miss. For anyone looking for a village house I would recommend they heed your comments well, but its not impossible if you do lots of research first. I also visit Bricodepot and Dedeman in Severin a lot when I am there for materials, they are the nearest big stores to us and though not always the cheapest always have stock.